International media brands have a duty to help consumers to understand what is “real information”, in light of the rise of so-called ‘fake news’, according to a panel of leading journalists. 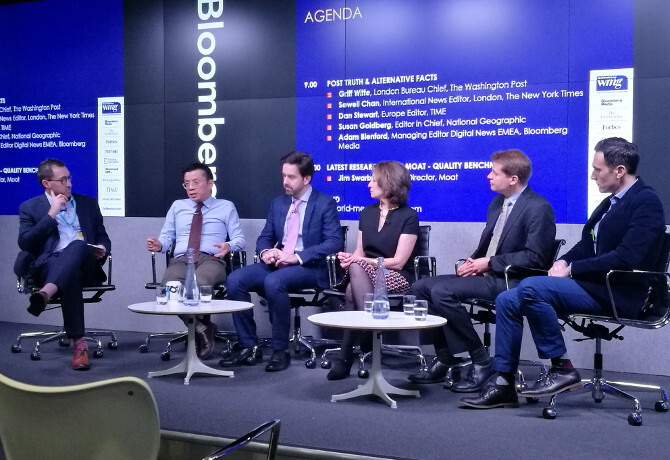 The World Media Group (WMG) last week (10 March) hosted a panel debate at Bloomberg’s London offices on the subject of ‘post truth and alternative facts’. Participants included Sewell Chan, international news editor at The New York Times; Dan Stewart, Europe editor of TIME; Susan Goldberg, editor-in-chief of National Geographic; Griff Witte, London Bureau chief at The Washington Post; and Bloomberg Media’s managing editor, digital news, EMEA, Adam Blenford. According to Goldberg, established media brands have a responsibility to help consumers navigate the masses of misinformation available on social networks: “We’ve got to do a job to help consumers to understand what is ‘real’ information, and what is not. We can help bring those critical thinking skills to consumers. The Washington Post’s Witte agreed, and said that media brands must now allow themselves to become politicised by hostile governments and authorities. “We need to be open to different possibilities, [and] not [present content] through a partisan lens. Our basic job is to be empathetic, to see the world through others’ eyes. We cannot allow ourselves to be seen as the opposition to a certain individual or party,” he said. However, TIME’s Stewart pointed out that facts “can be difficult”, and that emotionally-potent but inaccurate content “lasts longer”. The “economics of journalism” and fact-checking is making it challenging for international publishers to compete, he added. At the same event, the WMG – a strategic alliance of 10 major publishers, including The Economist, Forbes and The Wall Street Journal – presented the findings of a study carried out by Moat, which it claims proves the value of “trusted media brands” on campaign effectiveness. The report found that desktop videos seen on WMG inventory achieved viewability rates 21% higher than the average, against industry standard for viewability, namely 50% viewable for two seconds. On mobile, WMG inventory was found to achieve viewability rates 40% higher, engage consumers for 12% longer and encourage 43% more interactions than the average. Emma Winchurch-Beale, international sales director at The Washington Post and president of WMG, commented: “Marc Pritchard of Procter & Gamble has put campaign effectiveness into the spotlight this year, with his headline-grabbing comments about only accepting industry-standard-validated viewability for media transacting.